The petition garnered more than 750 signatures and was endorsed by Student Government. Carrying signs and chanting phrases like “UCPD you can’t hide, we can see your racist side” and “No quiet, no peace; no racist police,” students in the Coalition for Equitable Policing (CEP) delivered a petition to UCPD headquarters on Friday, addressed to Chief of Police Marlon Lynch. The petition contained three explicit demands in the hopes of mitigating negative experiences with the police: more transparency for complaints filed through an established information releasing process, a release of current policing policies, and a more accessible complaint process. The petition gathered more than 750 signatures, and around 50 students marched from campus to UCPD headquarters in protest. Upon arrival, the petitioners were met by Officer Michael Kwiatkowski in the lobby. He did not give a definite answer as to when a response would be given, but promised to transfer the written petition to Lynch. In November, CEP members, as well as Student Government (SG), voiced concerns about UCPD policy during a leadership conversation with Lynch. SG voted to endorse the petition this past Thursday. CEP has led two speak-out events, most recently in February, during which students and community members shared experiences and voiced complaints about the UCPD. Fourth-year Aerik Francis, one of the co-organizers of the petition, shared his personal encounter with UCPD. It was his first week on campus, and his parents were helping him move in. Lynch said that the department does not engage in racial profiling at the leadership conference in the fall. Second-year Ben Chametzky, another co-organizer of the event, said that CEP intends to address the reasons behind the instances of racial profiling. 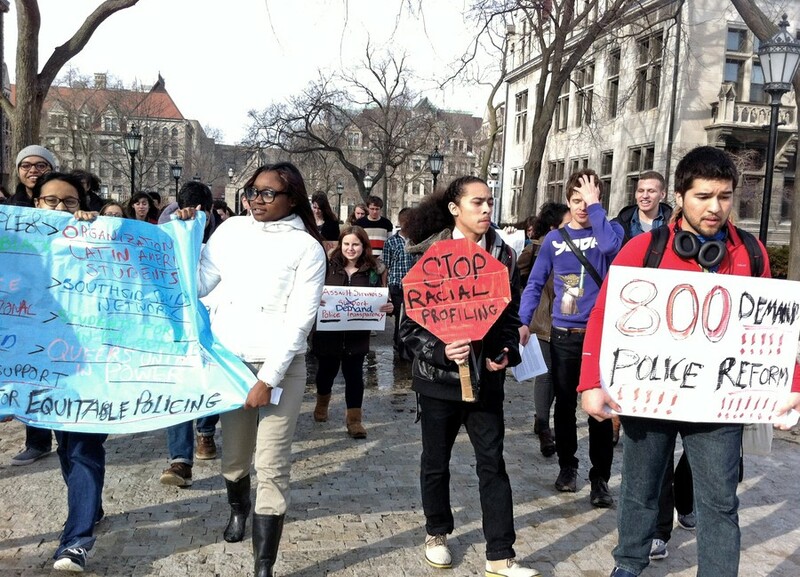 “Racial profiling is sort of the impetus for putting [the petition] together…. We found that there were lots of procedural and structural things that allow racial profiling. There’s not necessarily a mandate for the UCPD to stop people of color, but the structure of their current policies allow them to do so,” he said. If no response is given by March 12, the coalition intends to lead a second march to UCPD headquarters to demand an answer. “We’ve had meetings and meetings with officials and UCPD representatives; we asked politely, and they have not listened. Now, we’re going to take action and march in there and demand it from them,” third-year co-organizer Octavia Shaw said. Editors' Note: A UCPD representative was not contacted in the original reporting of this story and could not be reached during the editing process.